The results of a new experiment, to test Bell-like inequality violations, was released in Nature magazine. This study closes nearly all logic-loopholes that have been hypothesized in many prior experiments. In a sense, this is old news. The non-local results have been fairly universally accepted since the 1970s. Figure 1: An apparatus for performing a Bell test. A source emits a pair of entangled photons and . Their polarizations are analyzed by polarizers A and B (grey blocks), which are aligned, respectively, along directions a and b. (a and b can be along x, y or any direction in the x-y plane; here, they are along x.) Each polarizer has two output channels, labeled +1 and -1. A photon polarized parallel (perpendicular) to a will emerge in +1 (-1) at A. Similarly, a photon polarized parallel (perpendicular) to b will emerge in +1 (-1) at B. But in general, the photons are not in a state of polarization corresponding to a specific output channel, and then the formalism of quantum mechanics yields the probabilities of getting results +1 or -1, for specified orientations of the polarizers. For the entangled state of two polarized photons shown here, the quantum formalism predicts random results on each side (a 50% probability of being +1 or -1.) But it also predicts strong correlations between these random results. For instance, if both polarizers are aligned along the same direction (a=b), then the results at A and B will be either (+1,+1) or (-1,-1), but never (+1,-1) or (-1,+1): this is a total correlation, as can be determined by measuring the four rates with the fourfold detection circuit (green). 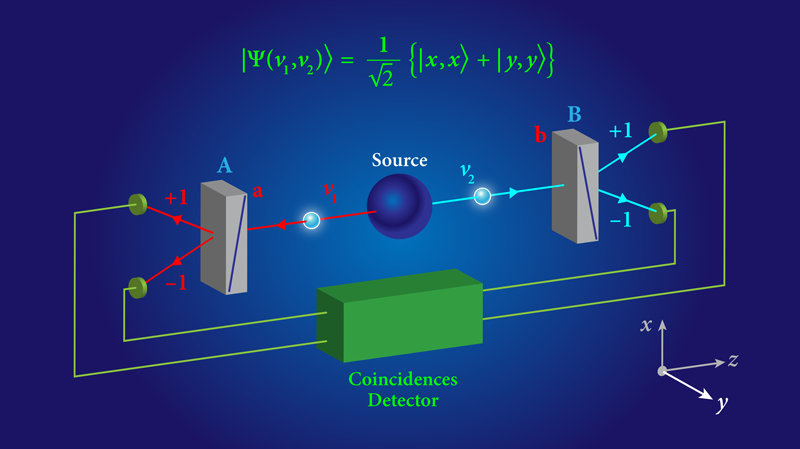 Local realism explains these correlations by assuming a common property of the two photons, whose value changes randomly from one photon pair to the next. Bell’s inequality, however, shows the correlations predicted by local realism are limited; but quantum predictions violate this inequality. A Bell test consists of measuring the correlations and comparing the results with Bell’s inequalities. To perform an “ideal” Bell test, the polarizer settings must be changed randomly while the photons are in flight between the source and the polarizers, and the detector efficiencies should exceed 2/3 (see text for details). 1. Everything is mechanical; only mechanistic explanations will do. >> Above (local-realism) has been known, experimentally, as false since the 1970's. Sheldrake is ignorant, it seems. Einstein lost the EPR paradox. Quantum Mechanics won. i.e.There is no local realism. "In conclusion, we perform a null hypothesis test which rejects local hidden variable models taking place as early as 11 years before the experiment with high confidence. Looking into the future, our experiment may serve as a benchmark to progressively rule out local hidden variable models deep into the cosmic history by utilizing the randomness in quasars of high redshift or even cosmic microwave background in future experiments. 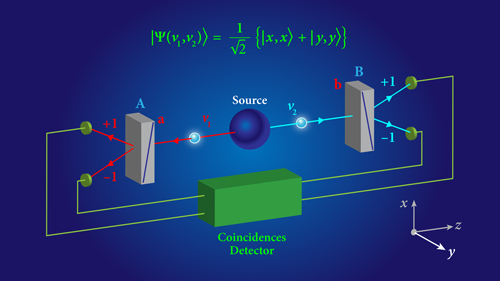 Further, we may find interesting applications in device-independent quantum information processing. Scaling up the spacetime extension in the local realism test is being actively pursued. The same system may also help to examine the hypothesis for human free choice and gravitational effect and to address collapse locality loophole."